Irregularity: Inaccuracy on the CD jacket artwork. Consider well the disadvantages of self-cherishing and the advantages of cherishing others more than ourselves. 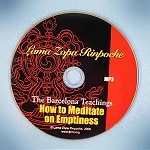 Get inspired by this MP3 CD where Venerable Sangye Khadro teaches the basics of meditation. The teachings include practical instructions on meditation techniques and guided meditations, great for those beginners who wish to begin a meditation practice and is also a useful refresher for those more experienced meditators. This teaching was given at Land of Medicine Buddha in 2003. Play time: 7 hours 30 minutes approx.